Update: check out our high ISO image gallery taken with the A7r mark II! 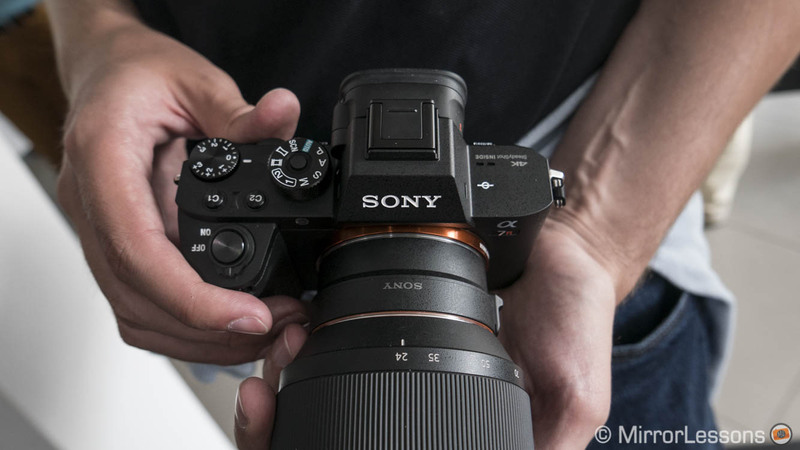 The recent announcement of the new full frame mirrorless flagship camera from Sony, the A7rII, has generated lots of excitement on the internet and for good reason. On paper the camera looks like a game changer, packing all the most advanced features a photographer could dream of: new high resolution full frame sensor, 5-axis stabilisation, the largest viewfinder on the market, advanced video recording (including internal 4K), a fast autofocus system and compatibility with a wide range of native and third party autofocus and manual focus lenses. What more could you ask for? We had the chance to see the new camera at the Sony European press event that took place at Pinewood Studios in Langley (Apparently they were shooting some sequences of the new James Bond movie just a couple of blocks away.) As we’d expected, the samples were all pre-production so we weren’t allowed to use our own SD cards. Actually the sample I got showed a maximum resolution of 18MP in the settings, which clearly shows that the firmware wasn’t final. 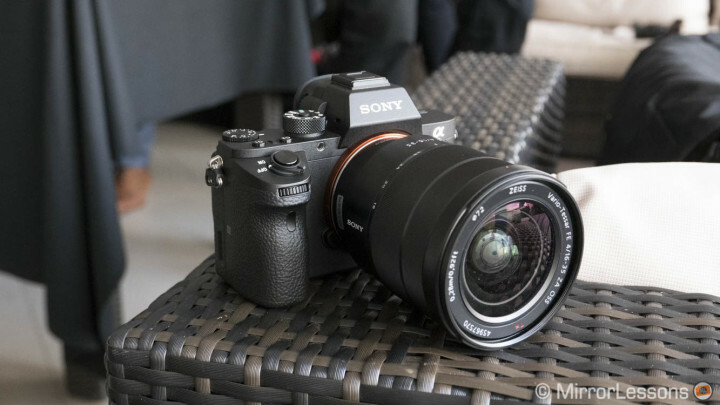 Anyway, what is this new Sony A7r II all about? There is a lot to be said but there is also a lot that still needs to be tested. Press events gives you a rough idea of how the camera looks and performs but it is hardly enough to build up a real first impression. The A7rII is the perfect example of a camera that deserves a long and in-depth test to unveil its real potential. Below you can watch our hands-on video with the A7r mark II. I’ll skip image quality here simply because we couldn’t test it. I do expect a lot from this new sensor: it is the first full frame BSI (Back-side Illuminated) sensor and has a new resolution of 42.4 megapixels. BSI is the same technology Sony introduced in 2009 on the WX1 (a 10MP compact camera) and that Samsung used on the NX1 and NX500 more recently. It allows the sensor to collect more light in comparison to traditional CMOS sensors by keeping the photodiodes closer to the on-chip lenses. The two cameras from Samsung have an APS-C sensor with stunning image quality and dynamic range so I am really curious to see how far the new A7rII sensor can be pushed considering its large surface. 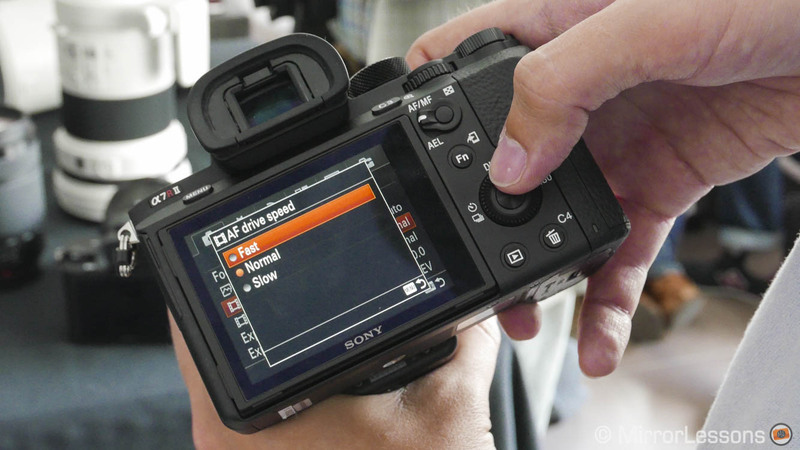 The new Sony sensor also has a faster readout (3.5x faster) and no optical low pass filter. The Raw file compression is 14bit lossy compressed and there is still no option for a 14bit uncompressed file. 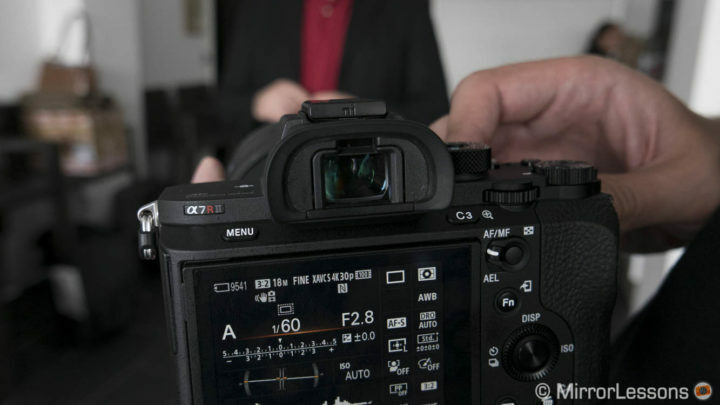 Like the A7II, the new A7r also has 5-axis stabilisation. Sony claims that it gives you 4.5 stops of compensation. What about the camera design and ergonomics? Well, there aren’t any surprises here. It is the same as the Sony A7 mark 2, which means it has the upgraded design of the second generation of A7 cameras. I personally liked the improvement made to the A7II when I reviewed it so I’m glad that the A7rII looks the same. The grip and hold on the camera is better and I find that the shutter release button is in a more comfortable position. The button and dial layout is exactly the same except that the mode dial on top has an unlock button at the centre. You need to press and hold it to turn the dial. The camera has a magnesium alloy body and is dust and moisture resistant. Also the lens mount has been reinforced. 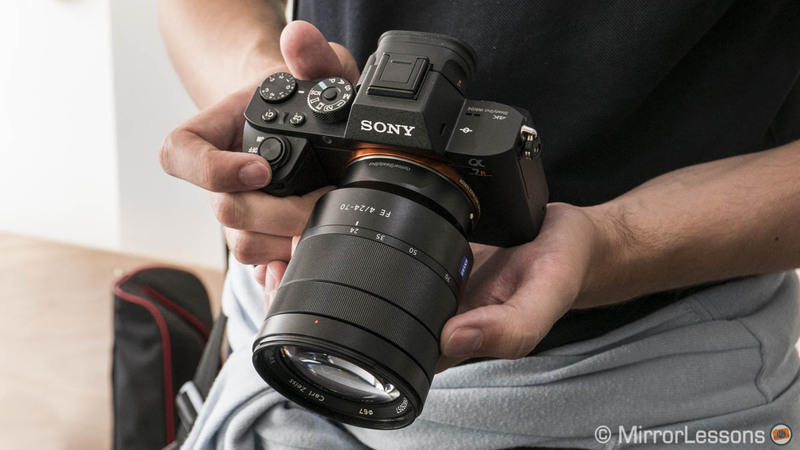 The A7r II looks exactly like the A7 II. The button layout on rear is the same. The mode dial on top includes a new Lock button. 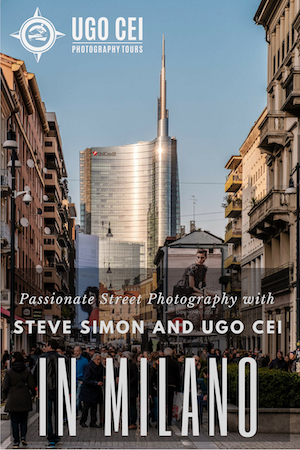 There is really only one new design feature worth talking about and that is the electronic viewfinder: it is one of the best I’ve ever tried. In fact I think it beats the already stunning EVF of the Fujifilm X-T1. Sony managed to make the EVF larger: 0.78x magnification (the largest on the market) and it corresponds to a 38.5° angle. The resolution is roughly the same (2.359k dots) but the lens features Zeiss T* Coating which improves its clarity. It is really nice to use even for someone like me who wears glasses all the time. The response time also seems excellent, though I don’t have precise specifications about the precise lag time. The new EVF is really excellent. 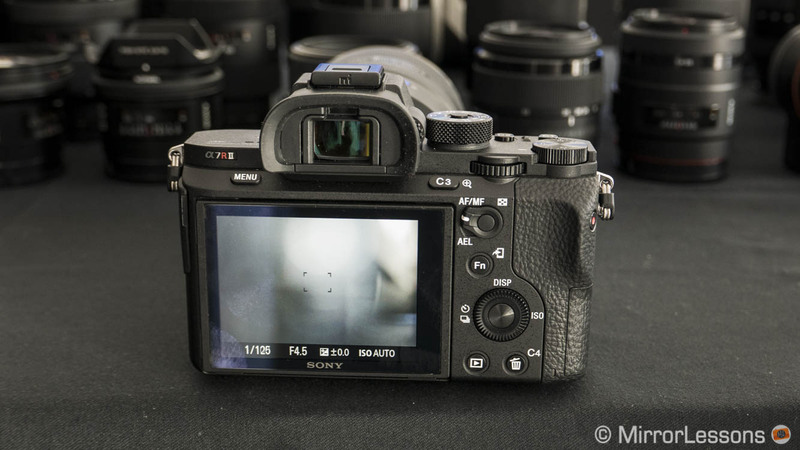 Sony also seems to have listened to the complaints and user reports about the first A7r. The shutter mechanism has been re-designed to reduce the shutter vibration that caused shutter shock issues on the first model. I took some test shots at the press event at the critical shutter speeds (1/100 – 1/200s) and even after zooming in on the image on the LCD screen, I could’t see any issues. Of course this quick test is far from conclusive. 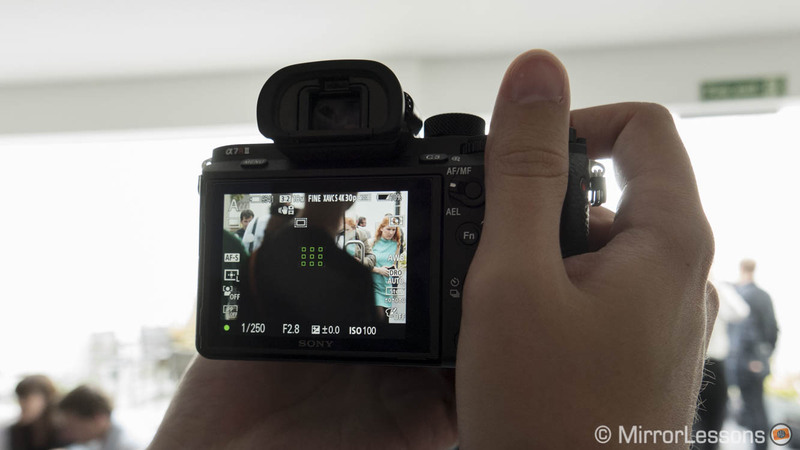 You can clearly hear that the shutter is different when taking a picture with the new A7rII: the sound is slightly more discreet and less clunky than the original A7r. Sony also included a first electronic curtain and a full electronic shutter option. This should be more than enough reassure potential users about the shutter shock issue. Also the new shutter is good for 500k shots. The only other aspect that was worth testing was the autofocus. And it is fast. It is as good if not better than the A7 mark II. First of all, the AF system is new and features 25 contrast detection areas and 399 phase detections areas. The sensor covers 45% of the entire frame area. The latter number is huge and brings some very interesting improvements. 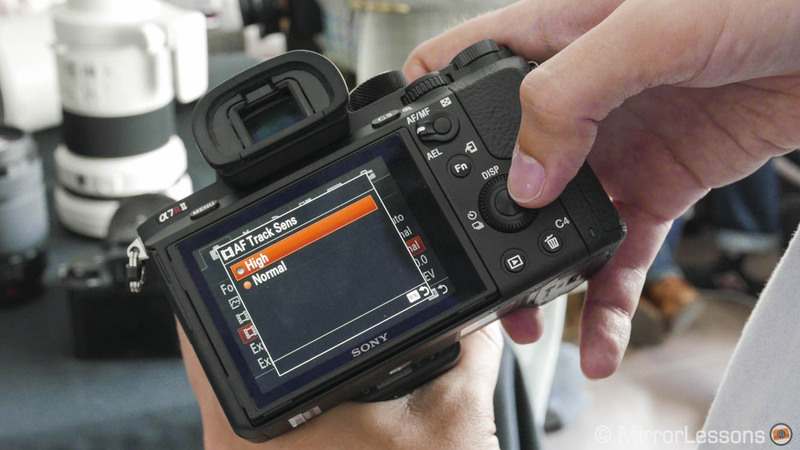 Sony claims that the camera is 40% more responsive than the A7r. I noticed right away that with a native E-Mount lens (24-70mm f/4), the A7rII was very reactive and fast at adjusting to various distances, even in a backlit situation where I was focusing back and forth between a bright outdoor setting in the background and a shadowy person standing indoors in the foreground (you can see a quick example in the video above at minute 3:23). With E-mount lenses, the camera automatically chooses between contrast or phase detection points. However when it comes to Sony A-mount lenses (DSLT lenses) there is a series of settings in the menu that are very interesting. 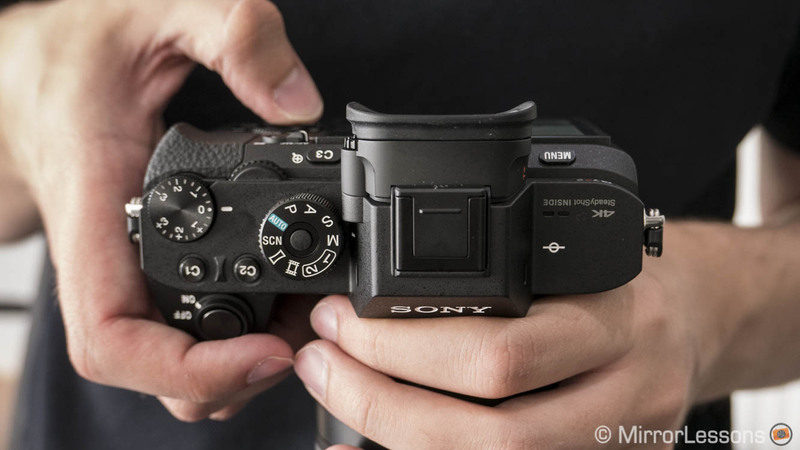 Let’s start with a quick recap: before, the only way to have a decent AF performance when mounting Sony DSLT A-mount lenses was to use the LE-EA4 adapter that includes a phase detection sensor and a translucent mirror (the same found in Sony DSLTs). The sensor is limited however (15 points only) and the results weren’t the greatest. The new AF system allows the user to mount the smaller and less expensive LE-EA3 adapter. It isn’t as fast as with E-Mount lenses but it is still better than the previous solution. I tried it with the Zeiss 24-70mm f/2.8 and the Sony G 70-30mm f/4.5-5.6. I noticed that it took the AF a little longer to lock onto the subject but overall I found it effective and usable. It wasn’t perfect, in part because the lenses sometimes lost focus completely in a high contrast / backlit situation, especially at the telephoto end. I did the same test with E-mount lenses and the camera had fewer problems. But overall what I saw is encouraging, and the fact that you can tweak some settings in the camera menu to fine-tune the performance is even more reassuring (you can see some examples in the video above at 4:52). The green squares represents the phase detection AF points. First of all, you can choose to use contrast or phase detection. I am not sure why Sony gives us the option to choose between the two since phase detection seems to work far better with A-mount lenses. Then there are two additional settings: the first is called AF Track Sens that you can set to either High or Normal. This helps to tell the camera if the subject you want to track is moving fast or not. The second option is called AF Drive Speed and you have three settings available: Fast, Normal and Slow. Here you can tell the camera how fast you want the continuous autofocus to be. I couldn’t test these different settings but they show that the camera has clearly been designed to be used with non-native E-mount lenses as well. 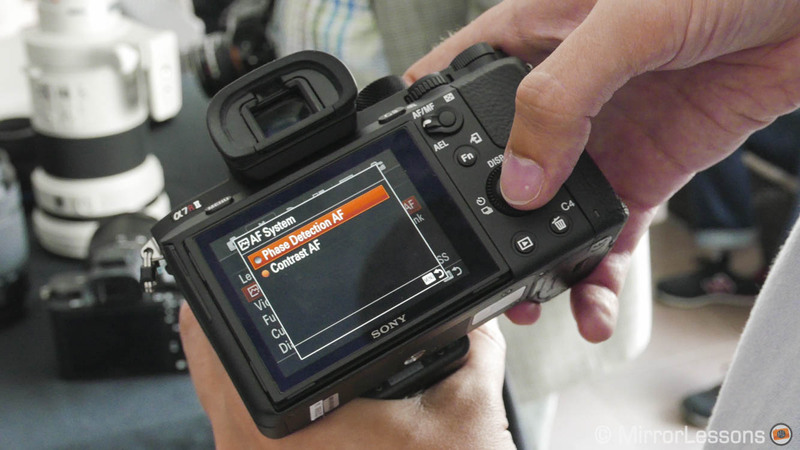 Note that with Sony A-mount lenses, the camera is compatible with SSM and SAM versions only. With A-mount lenses, you can choose manually contrast or phase detection AF. The new AF system also invites users to use third party lenses such as Canon or Nikon lenses. I couldn’t try this personally but some other hands-on articles are already showing that Canon lenses are reasonably fast with the A7r mark 2. By figuring out the best AF settings, we could truly have the first real “hybrid” camera on our hands, designed to perform with a very large range of lenses including non-Sony lenses. Now personally I have never been very interested in adapting DSLR lenses to a smaller camera body such as this one. I prefer to use the native lenses, as they are often smaller and lighter (except the FE 35mm 1.4). 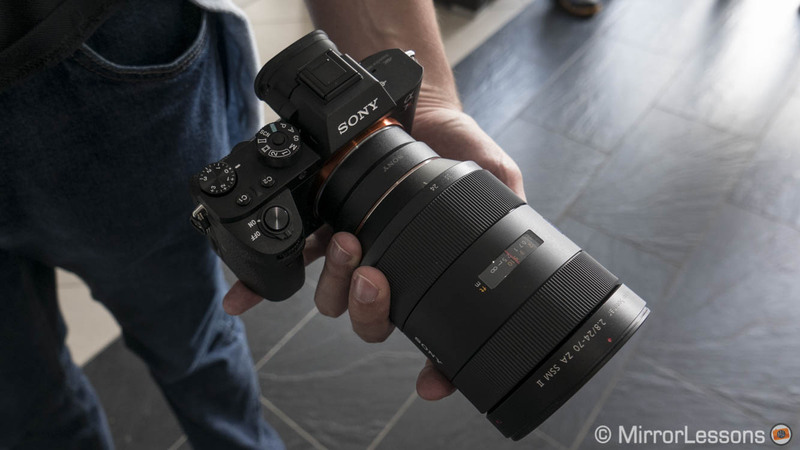 However for photographers who are interested in switching to Sony or who still own some of their DSLR lenses, it makes sense to want to use them especially if we are talking about very specific lenses that aren’t currently available in the E-mount lineup. Think about a Canon 85mm f/1.2 or a Zeiss 135mm f/1.8. On top of all that, there are all those great manual focus lenses. The fact that they could be adapted to the original A7 cameras was already one of the series’ major selling points. Of course we have yet to see how the new sensor performs especially with wide angle lenses. Considering the possibilities provided by the 5-axis stabilisation, the A7rII may become the first “universal” camera with which you can effectively use whichever lens comes to mind (AF or MF). It could also open up possibilities for some manufacturers to improve their firmware or release some adapters designed specifically to give the best performance on the A7rII. Of course all this needs concrete testing and proof that a press event can’t give you. On top of this there is also a reasonable continuous shooting speed of 5fps. It isn’t the best for a professional sports photographer but it is enough for many applications. One thing to consider are the buffer capabilities when shooting at 5fps. 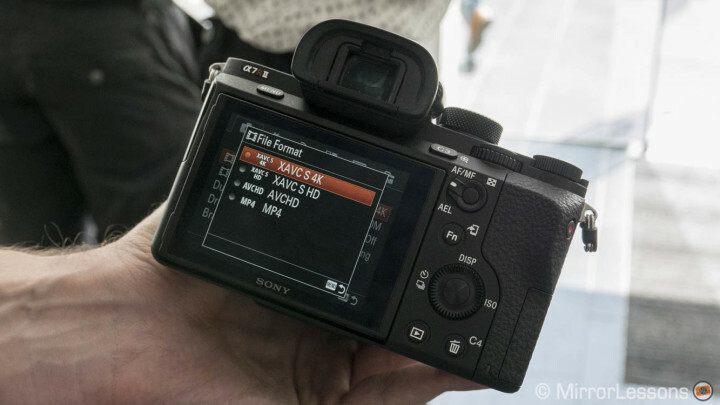 The A7r mark II can record 4k video internally. The last aspect I want to talk about is of course video. The A7r mark 2 is the first full frame camera to include internal 4k video recording. It uses the same X-AVC S codec found on the Sony A7s and can record in 4K resolution (3840 x 2160) up to 30fps at 100mbps. You also get Full HD options at a maximum of 60fps/50mbps and a 120fps option in HD Ready (720p) for slow motion footage. The camera has the same picture profiles (including S-log2) as the A7s. What is even more interesting is that the A7rII also has a Super35mm crop mode. Super35mm approximately corresponds to an APS-C crop. In this mode the camera uses 15 megapixels instead of 42 to over sample the data required to record 4K. This method allows for a full pixel readout without pixel binning, which eliminates the problem of moiré and aliasing. The full pixel readout works for 4K but not for Full HD. The A7s on the other hand can do it both for Full HD internally and for 4K via the HDMI output. The A7r mark II also has a clean HDMI 4:2:2 8bit output. 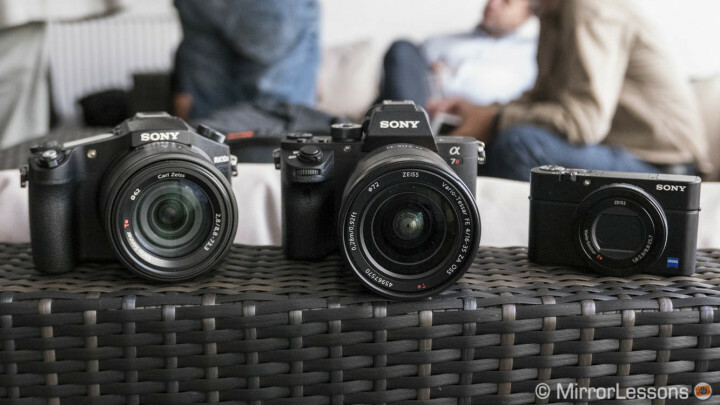 Sony doesn’t consider the A7rII a real competitor of the A7s but the similarity in their specs certainly raises some questions. First of all, the native sensitivity of the camera is 100-25600 ISO but can also be extended to 102400 ISO. In video mode, the maximum is 25600. The question is: how good is the A7rII at the highest sensitivities? Because if the gap with the A7s has been reduced, the latter might not look as unique as it did a few months ago. Moreover, many users have complained about not having internal 4K recording on the A7s: you need an external recorder, which means a bigger investment. The A7rII can do everything on its own and since the HDMI output is still valid, the external recorder becomes an option for better quality (4:2:2 8bit) and is not a constraint anymore if you want 4K video. After seeing the camera in person, what I can say is that the Sony A7r mark II could indeed be a game changer but only the first reliable and in-depth tests will be able to confirm this. What is clear is that Sony wants its system to succeed and is constantly striving to make its products more advanced. The camera doesn’t incorporate anything revolutionary but comes across as a mature product, albeit one of the most expensive at more than $3000. Sony also promises to have 20 E-mount lenses for early 2016, so we may soon be seeing a complete system that took roughly two years to build. In my book, there is only one word that comes to mind, and that is “impressive”. Sony also introduced the RX10 II and RX100 IV along with the A7r mark 2. Check out our first impressions here! As always, don’t hesitate to tell us what you think about the A7r Mark II in the comments below!